It may not be good looking nor has youthful exuberance, but is pampered ! The Ol Pejeta Conservancy is a 90,000-acre not-for-profit wildlife conservancy in Central Kenya's Laikipia County. It is situated on the equator west of Nanyuki, between the foothills of the Aberdares and Mount Kenya. Sudan, is a country in the Nile Valley of North Africa, bordered by Egypt, the Red Sea, Eritrea, and Ethiopia, South Sudan, the Central African Republic, Chad and Libya. It is the third largest country in Africa. The River Nile divides the country into eastern and western halves. A web search on ‘ Sudan’ gives the news of death toll in the explosion of a fuel tanker in South Sudan reaching closer to 200. Reports stage that many of the injured, who suffered severe burns, remain in critical condition after the accident outside the southwestern city of Maridi. Sadly, the explosion happened after a crowd rushed to collect gasoline from a tanker that had overturned in an accident in Western Equatoria. A modified search would take you to the news of Sudan lumbering over the gap in timbers ogling at the ladies feasting on alfalfa, hay and supplements. It's a wistful stare of longing, as at 42, he's the oldest – one to have lived in captivity and his age beginning to show. Milky blindness is slowly encroaching on his left eye, but he his keepers insist he still admires the ladies. When Sudan was born in 1972, there were more than 1000 of his ilk roaming the jungles of Central Africa. He spent his early years grazing the banks of the twisting White Nile, now South Sudan; caught in Shambe, South Sudan in Nov, 1973, shipped to the Dvůr Králové Zoo and in Dec 2009 - moved back to Kenyan Conservancy for a "Last Chance To Survive" breeding program. If you are wondering still – Sudan is a rhino, a white rhinoceros at that. Uncapped Punjab allrounder Gurkeerat Singh has been included in India's ODI squad for the first three matches against South Africa in October, while uncapped Karnataka seamer S Aravindwas picked for the T20 internationals. The players left out from the full-strength ODI squad that had toured Bangladesh were allrounder Ravindra Jadeja and seamer Dhawal Kulkarni. Gurkeerat, who bowls offspin took Jadeja's spot in the squad while legspinner Amit Mishra came in for Kulkarni. Gurkeerat, 25, had two impressive outings for India A recently. He had taken 2 for 42 and scored an unbeaten 87 in the tri-series final victory against Australia A in August, and then he made 65 and took 5 for 29 against a Bangladesh A team comprising several international players in the first one-day game in Bangalore. One regular name in all that list is Rohit Sharma, who has railed against the popular perception that he isn't making best use of his abundant natural talent, saying that he has got where he is through sheer hard work. Touted as malleable wrists and oozing talent, there are admirers and critics in perhaps equal number. A big time IPL star, Rohit as opener in ODI has the most enviable record of two double hundreds in ODI – 209 against Aussies and the highest score of 264 off 173 against Sri Lanka at Eden Gardens. Whether you are a supporter or not, you would be inclined to appreciate him joining anti-poaching campaign to save the wild animals of Africa, and, along with Hollywood actors Matt Le Blanc and Salma Hayek getting involved in taking care of the last surviving Northern White Rhinoceros [Sudan] of the rare species. "I have been a member of PETA (People for Ethical Treatment of Animals) and when I was informed about the cause, I thought it is my duty to join the anti-poaching drive. That's what got me to Nairobi. 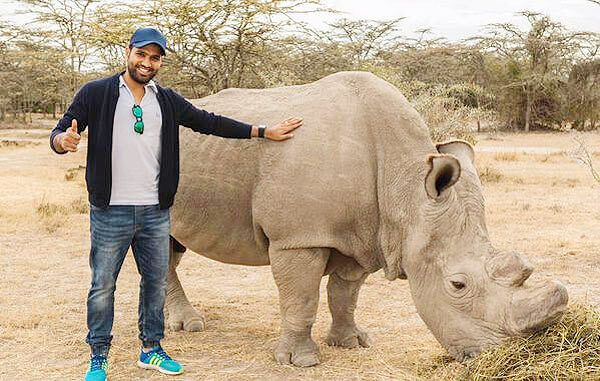 I was fascinated to have a look at Sudan (Northern White Rhino) and the sniffer dogs, who catch hold of the poachers," Rohit Sharma is quoted as saying. On his part Rohit said, "I will be donating for this cause as I am so happy to find out what kind of work is being done by its protectors’. Rohit also took to social media to make his thoughts known on the issue. Away in Kenya, rangers are risking their lives to keep a 43 year old rhino safe ...... the northern white rhinoceros (Ceratotherium simum cottoni), is one of the two subspecies of the white rhinoceros. Formerly found in several countries in East and Central Africa south of the Sahara, it is considered critically endangered or Extinct in the Wild. The last living male, Sudan, is the only hope to its sect’s survival. The demise of this species, is an indictment of what the human race is doing to planet earth and it’s not just happening to rhinos. Scientists call the mass wiping out of species by humans the "sixth great extinction" — the fifth being the one that killed off the dinosaurs 65-million years ago. The northern white rhino’s extinction is unusual only because it is such a large, recognisable animal. The world's last surviving male northern white rhino, ‘Sudan’ - stripped of his horn for his own safety - is now under 24-hour armed guard in a desperate final bid to save the species. Rhinos generally live up to 50 and thus with not many years left, it is closer to extinction. Sheer human greed ~and rhinos are not the only of its kind to be driven to such desperation !! vessel collision at Bosphorus strait ! Rugby ball on Cardiff wall !! Marina aquarium will be back !!!! Vinci's win dashes Serena Grand slam dream ! Bird (peacock) hit ~ not a plane, but a rail !! slave tetris ~ what a nauseating concept !! Cricketer turned Taxi driver ~ is that not sad ? Tropical Storm Erica .... Hurricane Hunters !